Major Religion: None; Nimbar is referred to only as a cultural influence, per his wishes. Nimbusians (pronounced Nim-boo-zee-in) are the second most populous race in SW City, alongside Humans. They make up approximately 35% of the population and have always played a role in this nation's history. Once enslaved, they are now free to roam all over the Scarabia, settling down to a life alongside humans. - Manufacture 2:8-9, The Book of Four? Short in stature but wide in girth, Nimbusians appear to be made of a soft, cloudlike yet organic material that is almost impervious to harm. Scientists have studied this material, dubbed lifevapor, and have concluded that Nimbusians are made of water vapor that has inexplicably started functioning as a cohesive and sentient being. Female members of the race possess hair made out of super-condensed lifevapor that resembles that of a humans'. This is the main distinguishing feature between the sexes and is in fact used in reproduction (see the 'Biology and Special Characteristics' section below). Nimbusians that live in urban areas amongst humans have been known to wear clothes - this is frowned upon by the ultra-traditionalist Children of Nimbar, or 'Pures'. 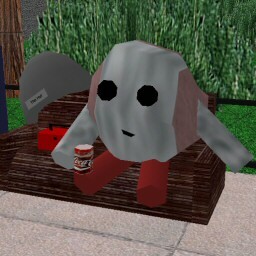 All Nimbusians do wear shoes, usually brown shoes for males and pink shoes for females because walking on legs made out of lifevapor tends to disperse and erode the complex water molecule structure holding them together. At one point Nimbusians had their own language called Nimbex, however no one really speaks it any more and it is treated as a dead tongue (even by the Pures). Today, most Nimbusians speak Common and some have even been known to use Lingarian or even Singlish. As everyone knows, the ancestral home of the Nimbusians is of course Nimbus Land, a gigantic floating kingdom over James River, borne aloft by fluffy white clouds. This has been the centre of Nimbusian civilisation since tribal times, and thus is the single constant in the ebb and flow of the cloud-people's society; it remains to this day the only completely Nimbusian city, although there are similar cloud-settlements scattered around the SW City Territory. 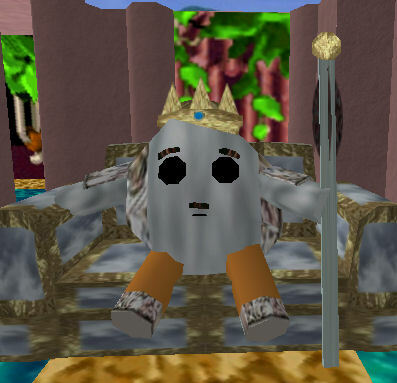 The King of Nimbus Land (currently Nimbus XXXIV) is the sole ruler of all Nimbusdom, though now he is treated more as a cultural ruler than a supreme leader. Nevertheless, nearly everything in Nimbusian society revolves around the monarchy and aristocracy; however nobility is not given as birthright, but rather awarded on merit. Nimbusians as a rule are very hedonistic, in the design of their Book of Four patron, Nimbar. According to Nimbar, his children were not meant to worship him - instead, enjoy all that life has to offer. Arts, music, philosophy, history; Nimbusians prize these things above all else, however they will not let them get in the way of a good time. By no means does this mean they are reckless; apart from the notorious terrorist group 6th District, Nimbusians as a rule are quite sensible, though it may not seem that way on first glance. They can be seen doing some pretty crazy things around the city, and perhaps that's the way they like it. It is unknown just how the Nimbusians came into being, because of their incredibly unusual biological makeup. However, there is evidence to suggest that what we now consider Nimbusians are actually a smaller, 'pygmy' race derived from an original species which was much larger. Ancient cave paintings and oral traditions suggest that these so-called Cloud Giants? were the original children of Nimbar, but were far too reckless and irresponsible, and were actually credited with drying up the jungles and swamps that covered Alphaworld, due to their fondness for creating vast electrical rainstorms. This upset the balance, legends say, and the deluges that came afterward formed the Irenic Ocean. The legend has not been confirmed as fact, and scientists are constantly debating the issue over whether such a thing is possible. Regardless, around 0 CE, Nimbusians, like humans, began forming into tribes and constantly warring over territory. When the Heretika were subduing and conquering helpless peoples all over SW Island, a young cloud-warrior from the Jululan tribe named Nimbusillan ('Star of Nimbar'), united all of his people under one banner and went to war against Axatar, a fearsome Heretika dreadlord. Unfortunately, Nimbusillan was killed in the final battle, but his death was avenged, the victorious cloud-people securing a large amount of territory in what would become James River. In the great warrior's honor, the city Nimbusillan was built and named after him, and in fact, all of his race took his name, recognizing themselves as Nimbusians. His son, Nimaulur, was offered kingship, and became the first ever King, styling himself 'Nimbus I?'. Since then, each king has been called Nimbus, all the way down to the current king, Nimbus XXXIV. After thirty years of peaceful rule, the first king of Nimbus Land died, bequeathing his title to his son, Nimbus II? ; he is best known for his incredible adventures across the island, defeating fearsome beasts and unearthing treasures left by Heretika lords. Apparently, he had to leave some of his cache behind on the slopes of the Schattenhorn, where it remains to this day, undiscovered. While Nimbusian-human relations at this time were cordial, later on things would take a turn for the worse, and many Nimbusians were put into slavery during the Feudal Era, reviled and seen as freaks of nature. Things would not get much better for a long time, and Nimbus Land rises higher into the skies, becoming increasingly isolationist as the kingdom of Jamesar? declares war on them and swears that every last Nimbusian in their lands will be in chains. In 1252CE, the House of Sphoreie, a militaristic noble house, dared to leave the protection of the city and attempted to live life on the surface. The Hyrule province of Jamesar took a dim view of this, and the Sphoreie-Hylian War? began, ending with the House's defeat on the slopes of the Citrus Mountains. The dismayed Nimbusians fled, eventually ending up in sympathetic Clannar?, where they were given a ship by Amalia I? and sailed to the east, never to be heard from for hundreds of years (and thus, the Numbisians were born). Nimbusian slavery lasts even until the days of the Scarabian Empire, Emperor Alexander Comitus recognizing their potential for forming the base of a strong economy. It is not until the Empire collapses that Nimbusians begin to become bolder in their protesting, and the malevolent anti-establishmentarian rebel group 6th District is founded by Caram Darkheel. It is mostly thanks to their scare tactics and the freeing of slaves through force that the Nimbusians were freed from most legal slavery in 1911, and their total emancipation came with the passing of the SW City Civil Rights Act? by the provisional Scarabian Republic government in 1925. 6D, however, did not disband, and began turning their attentions to less altruistic means, eventually becoming the dastardly criminal organization it is today. The Children of Nimbar was officially formed in 1962 in response to the older traditionalists becoming dismayed at the way human mannerisms and speech affected the younger Nimbusians, and began pressuring the King of Nimbus Land to step in and forbid Nimbusians from leaving home. The King at the time, Nimbus XXXIII, refused to bow to their wishes, and Nimbusians eventually grew to become 35% percent of SW City's population through opportunities, most of them living on the surface peacefully amongst humans. The Metropolitan Nimbusian Association was formed in response to the crotchety ramblings of the Pures, and continually defend their surface lifestyle. Nimbusians are essentially cloud-people, and therefore humans are puzzled on several things, particularly how they manage to eat, excrete, and reproduce. Actually, compared with the biology of some species, Nimbusians are relatively straightforward; their vocal chords and oesophagus are made out of hardened vapor, their eyes super-reflective vapor that transmits vision to their water-based brains. Eating and drinking allows them to stay cloudy; their sophisticated digestive system transforms solid and liquid forms into lifevapor, which allows Nimbusians to function. They do not have any nasal appendages, and therefore do not register smell - instead, their highly developed sense of taste 'tastes' the moisture in the air around them, acting as a sort of auxiliary nose. Nimbusians urinate, though when they do it is only excess water, and sometimes do this constantly, oozing it out of their vapor pores. Reproduction and life expectancy is another matter, however. Female Nimbusians possess hair, which as explained before, is super-condensed lifevapor. This hair acts as a 'womb' of sorts, and the hair assembles a Nimbusian from excess vapor produced when the female eats or drinks. The male first has to plant a seed of life-vapor from within himself into the hair, the act of reproduction requiring both sexes. Nimbusians have been known to live as long as 150 years, provided they are not evaporated or dispersed before they do so naturally, after the lifevapor disintegrates. Because of their lack of solidness, it is quite impossible to 'beat' a Nimbusian to death; in fact, in ancient times, killing of Nimbusians was quite simply done with torches, or hot branding irons, which simply evaporated them. Legend states that the Nimbusians' supposed ancestors, the Cloud Giants, were able to generate extremely powerful rain and electrical storms on command. Nimbusians cannot do this without intense concentration, and even a light shower causes them to be incredibly drained. However, one powerful ability they have in limitless amounts is the ability to form small air vortexes which propel them into the air, and condense ordinary cloud matter into shapes solid enough to walk on - this is how Nimbus Land floats, and how it was built in the first place.